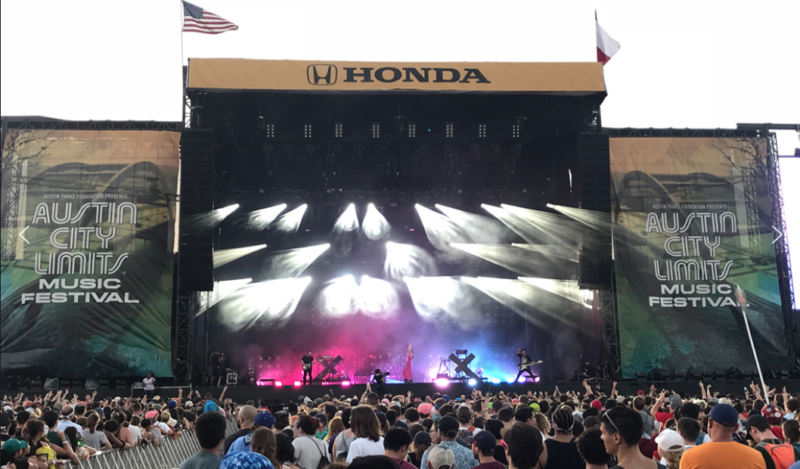 High End Systems’ Sola Series LED fixtures were “the meat of the rig” for a main stage at the 2018 Austin City Limits Music Festival in Austin, TX. For two consecutive weekends in October, the lighting fixtures perked up performances with intense bold beams, and dazzled with animated gobos and aerial effects for Arctic Monkeys, Brandi Carlile, Chvrches, Odesza, X Ambassadors and other acts. Houston-based LD Systems rigged their newly acquired HES products on the Honda Stage. The 25 SolaFrame 3000s hung on the three main trusses, with 18 SolaHyBeam 2000s on the side and downstage trusses of the 60-foot wide by 60-foot deep stage. LD Systems’ LDs Nathan Brittain and Lance Williamson were responsible for specifying the gear. Brittain worked with ACL Music Festival designer Jack Rushen on the overall stage design. The SolaHyBeams were being used for their hybrid features, as a wash and for the bold beams for audience and effects looks. Touring LDs were reportedly impressed with the output and intensity of the HES LED lights. “They were blown away with the output they got from LED fixtures,” Brittain notes. The SolaFrame 3000 is a 1,000-watt LED fixture emitting 37,000 lumens, while the SolaHyBeam 2000 is a 600-watt fixture emitting 26,000 lumens.